Motherhome Guesthouse Siem Reap is probably one of the most ill-named boutique accommodations we’ve ever stayed in, but ill-named in a very positive way! In fact, I’d had to say I have never been so pleasantly surprised by a hotel in all my time as a traveller in Asia!!! This was our first visit to Cambodia and as is often the case when we’re visiting somewhere for the first time, I was apprehensive and keen to make sure I booked somewhere nice – otherwise my other half might have a bad time and we’ll never go back there again. Know what I mean? I always start by reading TripAdvisor to see what people are saying about different hotel options. I don’t trust TripAdvisor recommendations, which is one big reason why I created this website, because they are too easily manipulated. A hotel might have five great reviews and one bad review, but what you don’t know is the five great reviews are all written by friends of the owners, while the one bad review is some poor fool who stayed there based on the others. Extreme example, but it happens. So Motherhome Guesthouse and Motherhome Inn were not the top rated hotels in Siem Reap – in fact they were #10 at the time (although now #8). What really impressed me though was that there were no “poor” or “terrible” reviews and over 700 people had left reviews by that stage. This doesn’t happen by accident, and it’s usually a sign of a very well run hotel. So I jumped onto tripadvisor.com and made a reservation, knowing I could easily cancel it if I found somewhere better (the great thing about booking.com). Within an hour I had an email with the subject line “Room confirmation from Motherhome Inn” which confirmed all the details of my booking, described our breakfast options and offered a pickup from Siem Reap airport on arrival. I was floored! And the writer, Mr Kimleang, courteously requested that if we changed our minds about the booking, could we please advise 5-7 days from arrival so they could re-allocate the room. At Siem Reap airport we were greeted by a lovely young man with a sign saying “Motherhome Inn”, who snapped up our bags and showed us to a modern air-conditioned van in the carpark. He spoke excellent English and even apologised for not being able to park closer to the terminal building (he was 50 metres from the door). He dropped us at the hotel and carried our bags inside, handing us over to a concierge. A concierge? In a guesthouse? No way! But yes, as I said this is one of the most ill-described places we’ve ever stayed in. 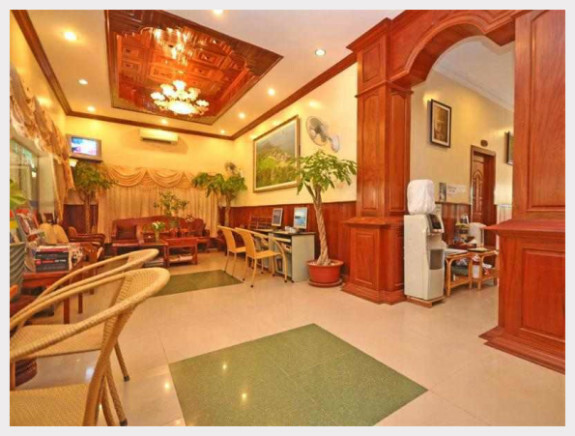 Because Motherhome Guesthouse is nothing less than a 4-star hotel that’s run with the intimacy of a small guesthouse. These are people who’ve capitalised on their success and reinvested back into their business, growing from a guesthouse to an inn and then to a hotel, without losing a whit of charm and elegance. We were asked to take a seat in the grand foyer and given an iced fruit juice and a chilled towel to take the heat out of us while we filled in the hotel registration form. We were offered the same thing every time we came back into the hotel after a day out too! Amazing! Formalities out of the way, we were shown to our room on the top floor at the front of the hotel. Normally this might be cause for concern but not at Motherhome Guesthouse where they have smooth elevators and almost no traffic noise to bother with. It just meant great views and a balcony that, while shared with the rest of the floor, seemed to be ours alone most of the time. The room was one of the nicest, cleanest, most comfortable and well presented rooms we’ve ever had in Asia – and that includes having stayed in some 4-star and 5-star hotels in Malaysia. A big king bed, flat screen TV, fridge, air-conditioning, a window over the pool area and another over the balcony … and all this for USD$25 a night? We could have stayed here forever. It’s in our retirement plan now! In indelible ink!! After unpacking and washing off the travel dust, we ventured out into the street and found there wasn’t much of use nearby, so we decided to hike into town. We could have taken a tuk-tuk (there are always several waiting outside Motherhome Guesthouse for the benefit of guests) but we found we could walk into Bar Street (centre of Siem Reap) in about 10 minutes. When we got back from dinner, after another refreshing iced fruit drink, we organised with the concierge to take a tour of Angkor Wat the following day. When we came down the next morning, there were two lunch boxes packed for us and a smartly-presented tuk-tuk driver waiting for us out the front. We had a great, if exhausting day out. Breakfast is included in the room rate at Motherhome Guesthouse Siem Reap and is served in the restaurant just off the foyer. Again, we were bowled over by what was on offer and the elegance in which it was served. Staff opened and closed doors for us, refilled anything that was running out and generally made sure we had everything we wanted. And we did … fresh fruit, croissants, toast, eggs, cereals, tea and coffee … pretty much what you’d normally pay USD$25 each for in a brand name hotel chain. Oh, and you can eat it out by the pool too! Out there are waiters who will cook your eggs to order!!! We just could not get over the generosity and thoughtfulness of the staff at Motherhome Guesthouse. They made our stay simply awesome and we’ll definitely be going back there some time soon. Find rates and book online for Motherhome Guesthouse. 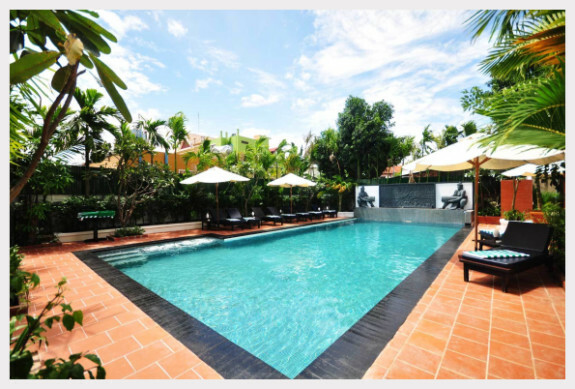 Find more hotels in Siem Reap on TripAdvisor. Tony and Tracy Gilbert are veteran Asian travellers with experience living and travelling in Thailand, Vietnam, Cambodia, China, Malaysia, Singapore, Indonesia and other Asian countries. Tony is a former journalist and editor who writes for many travel websites. We may receive some small compensation from advertisers on this site, which is used to offset the hosting and operating costs of the website. This compensation does not affect the price you pay for these services and we always strive to provide the best prices possible for all travel options featured on this website. This website uses "cookies" (small anonymous data packages about your location and browser type) to give you the best browsing experience possible. If you continue to use this website without changing your cookie settings or you click "Accept" below then you are consenting to the use of "cookies".